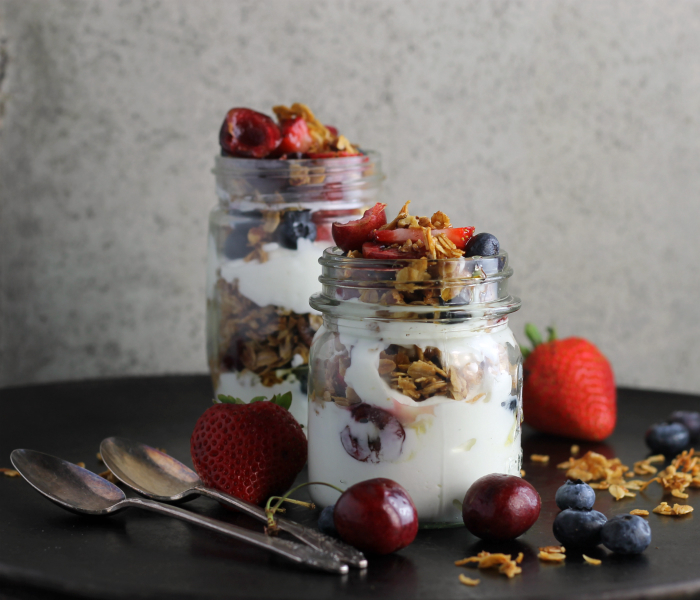 But for now, I am going to start out with a simple recipe… homemade granola and Greek Yogurt. At one time I ate a lot of yogurt. You know the ones that have a ton of sugar in them. I always thought I was eating healthy until I started looking at the labels and noticed how much sugar I was really eating. So much for eating healthy. Then my sister told me that she had started making her own yogurt. She loves eating it with honey, fresh fruit, and granola. Well, I haven’t gone so far as to make my own yogurt, but I have changed over to plain Greek yogurt. I have started topping my plain Greek yogurt with honey, fresh fruit, and granola. I have to say that I don’t miss the sweet yogurt. I believe I will never turn back. This is where my homemade granola comes in. This is a simple one, with oats, coconut, honey, pecans, and just a bit of brown sugar. It goes perfect with the Greek yogurt. I love eating this homemade granola and Greek yogurt for breakfast, but to tell the truth I love to eat it after dinner, as a dessert. So when trying to stay away from eating too many sweets, this helps me feel not so deprived. Combine the oats, pecans, and sweetened coconut in a medium bowl. Combine the butter, honey, and brown sugar in a small saucepan. Heat over medium heat until the mixture comes to a boil, remove from the heat and add the vanilla. Pour the honey combination over the oats, pecans, and coconut and mix until well combined. Spray a jelly roll pan with a nonstick cooking spray. Spread the granola mixture on the prepared pan making sure that it is spread out evenly. Place in the preheated oven for 18 to 20 minutes stirring a couple of times during the baking. 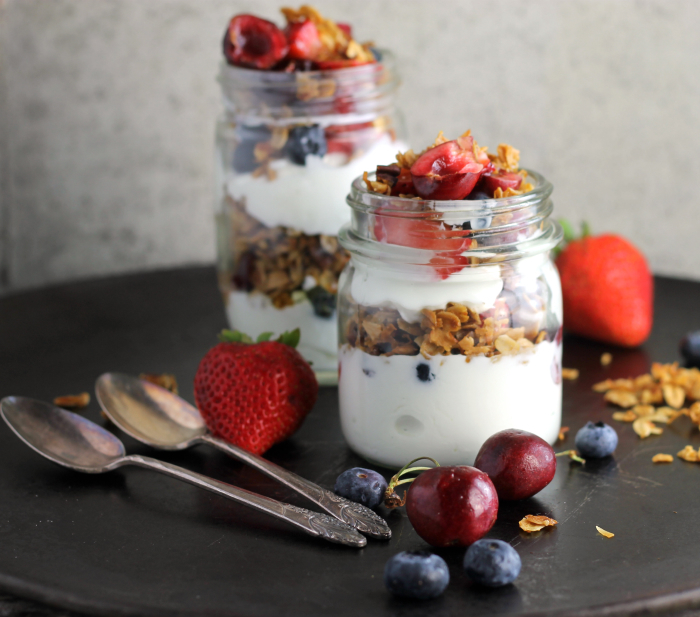 Add a layer of Greek yogurt, top with honey, add your favorite fruit/berries, and top with the homemade granola - repeat. Pictures are great. Love the jars. Welcome back. You’ve been missed. Hi Dawn – so glad to see you back! Welcome back, Dawn. 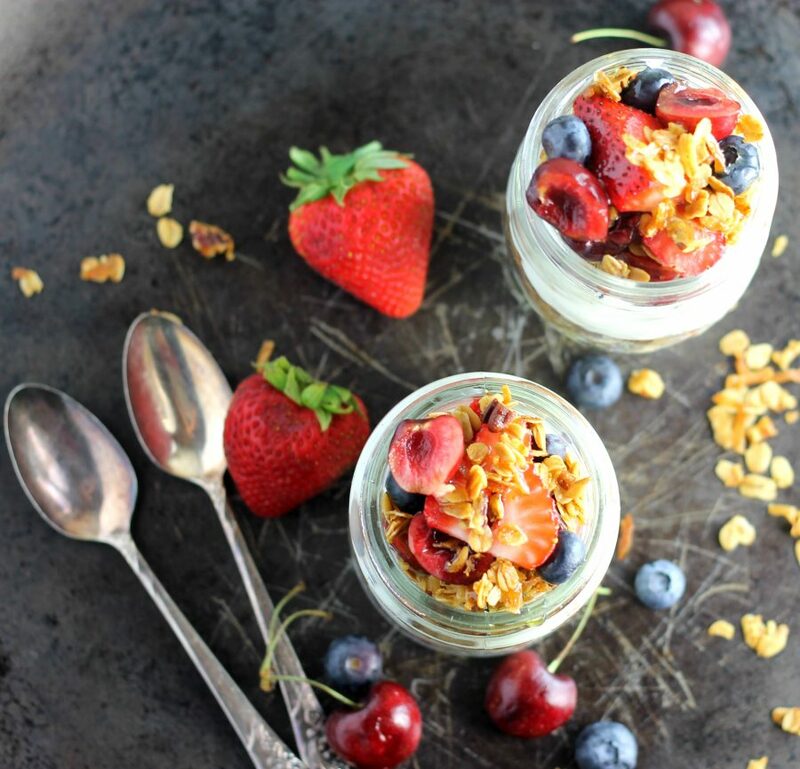 This breakfast parfait looks not only delicious, also very healthy too. Welcome back, Dawn! And what a way to come back, too…these parfaits sound amazing! I used to have a boss who made her own yogurt…in the office. A little odd, but hey, you gotta do what you gotta do. I’ve never tried making it myself, but I probably should. We eat a lot of Greek yogurt around here, and I’m a little afraid to look at the sugar content in there. 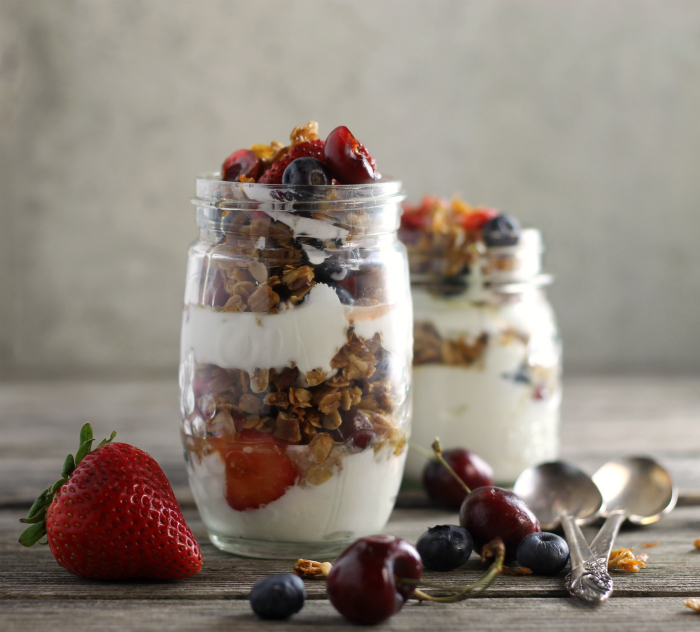 Thanks for the parfait idea…looks perfect for a summer breakfast! Welcome back! I’ve made yogurt, but am not sure if it’s really worth it, particularly since Greek yogurt is so readily available. Anyway, lovely parfait — thanks!